Hot or cold? What is best on an injury? After an injury, you might want to use an ice pack – or would heat be better? We will look at the pros and cons of hot vs cold in treating various injuries. Icing involves placing something cold onto the skin to decrease the temperature of muscles, tendons and other tissues in the area. It is best used for injuries that have just occurred or are new. It helps to reduce pain and muscle spasm. Soak a towel in ice water, squeeze the water out of the towel and apply to the area for 1-5 minutes. Repeat the process for a total of approx 15 minutes. Immerse the foot and ankle into the bucket for approximately 15 minutes. Redness and numbness will develop. Cold treatments can feel unpleasant so might not be suitable for some people such as children. If there are any diseases of the blood vessels in the feet and toes, it is not appropriate to use ice therapy. 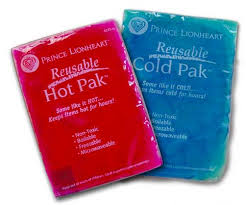 Heat packs involve placing something warm on the skin to increase the temperature of muscles, tendons and other tissues in the area. Warmth makes the muscles more stretchy and pliable and also increases blood flow to the area. Increased circulation can bring more blood past an injury and help to clear older, stubborn issues. Heat is best used in people with long term pain, conditions such as osteoarthritis, rheumatoid arthritis, chilblains and chronic inflammatory conditions. Heat is not ideal to use on injuries that have just occurred as heat will make the healing time longer by increasing blood flow to the area and as a result increasing swelling. The use of heat therapy should not be used in people with sensory issues or loss and any diseases of the blood vessels. Contrast therapy is the alternative application of heat and cold. It reduces inflammation and swelling via a pumping-like mechanism. Heat causes an increase in blood flow to the area and cold causes blood to leave the area. The overall effect of this pumping mechanism is to increase blood circulation. Contrast therapy should not be used on people with diseases of the blood vessels. If you are not sure if any of these therapies are right for you, consult your local podiatrist first.